Come discover the Brew On Premise concept at Terminal City Brewing. Formerly West Coast U Brew, we are Vancouver’s first and finest U-Brew facility. Save money while enjoying a variety of micro-brewed premium beer styles and wines from around the globe. No membership is required. It doesn’t matter if you are a first-time brewer or a seasoned veteran looking for a new place to brew, we will help you throughout the entire process — it’s fun and easy to do. Plenty of choices and varieties will keep you coming back for more. 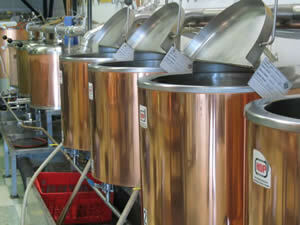 We have top of the line commercial steam-heated copper-jacketed kettles that make beer the right way. NO KITS! All-grain and extract brewing specialists!! We are Vancouver’s first full-service “Brew On Premise”. We opened our doors on May 10, 1993 and have since provided the best products and services available in the industry. Yes, we offer all-grain craft brews! Fill your growlers or use any clean bottles you like. Check the beer list for our selection of all grain ales and lagers. We offer a full complement of wines from around the world. Check out our wine list for all your on-site wine making needs. We have gift certificates available in any denomination. Contact us or drop by the shop to buy the perfect gift for a beer/wine lover. Allow 2-4 weeks for beer and 4, 5, or 6-8 weeks for wine. You can buy our bottles or bring your own CLEAN bottles in. Come in and package your own product and away you go. Save money and enjoy a superior product at half the cost of commercial beer. Drinking at home means no drinking and driving. We can help you save $$$$. Enjoy a variety of different beers/wines. 100% natural, no preservatives. The best beer is all-natural. No muss or fuss. We do the cleaning. We take all the guess work out of brewing too!! Call 604-875-0600 to get started!! Why wait? Give us a call to get started. Please note that all beers must be started 2 hours before closing. "Beer and whiskey are a mans worst enemies. But the man who runs away from his enemies is a coward!!"